The complete guide to treating and preventing illness through micronutrient therapy! Prevention and Therapy Through Balanced Nutrition. The selective use of micronutrients is a simple and practical method of nutritional therapy with proven effectiveness. This handbook gives both professionals and interested consumers a thorough understanding of the prevention and treatment of illness through balanced nutrition. A practical color key guides you through this handbook. The basic principles of micronutrition: Micronutrient therapy concerns the treatment of illnesses with substances that are normally present in the human body, such as vitamins, minerals, trace elements, amino acids, and essential fatty acids. In this introductory section, you learn how to use this knowledge for enhanced health and well-being. What is healthy nutrition? This section introduces the basic building blocks of balanced diet, and includes a brief introduction to vegetarian nutrition. The micronutrients: In this section, all micronutrients are presented, along with a discussion of their functions in the body and their therapeutic benefits. The effects of deficiencies, and their manifestations, are described in detail. Micronutrition through the life cycle: Micronutrient needs do not remain constant throughout life. During pregnancy and breastfeeding, for example, requirements are higher for many micronutrients. The nutritional needs of children differ greatly from those of the aged. The effect of nutrition and lifestyle on longevity is also discussed in this chapter. 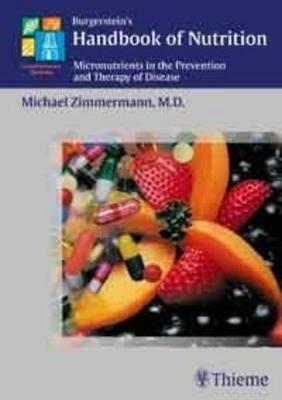 Micronutrients in prevention and therapy: This important section provides detailed information on the use of micronutrients in the log-term prevention and therapy of specific conditions and diseases. Appendix: Here you will find a variety of additional information on drug-micronutrient interactions, nutrient-nutrient interactions, and laboratory assessment of micronutrients status. Michael Zimmermann, MD is Director of Postgraduate studies a the Laboratory for Human Nutrition, Swiss Federal Institute of Technology, Zurich, Switzerland.